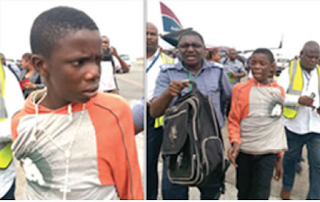 Shocking revelation emerged Wednesday evening that Daniel Ricky Ohikhena, the boy who stowed from Benin to Lagos in the wheel of Arik Flight W3 544, on Saturday, August 24, 2013 has been abandoned by the Edo State government. The boy had thought the plane was US-bound where he had wanted to go and study Aeronautic Engineering. His ‘bravery’ caught the attention of the Edo State government, under the leadership of Adams Oshiomole, who promised to help him fulfil his dream. Governor Adams Oshiomhole met with the boy and his parents to know what was actually Daniel’s problem. Little Daniel made his intention known to Oshiomole, who promised to sponsor his education up to the university level. The governor eventually secured admission for the 14 year-old boy in one of the top secondary schools in the state in September 2013. However, latest report has it that the state government has since January, 2014 stopped paying Daniel’s school fees. A family source told DAILY POST on Tuesday that efforts of the parents to reach the governor had been futile, adding that each time they went to the government house, security officials would tell them the governor was not on seat. “The state government only paid for Daniel’s school fees twice. That was first term September 2013 and second term in January 2014. “Since then, the governor has not looked on their side. The school authority is troubling the family because the government has refused to keep to its promise and they are even threatening to send him home anytime soon,” the family source who would not want his name in print said. Speaking further, the family source said the family had concluded plan to withdraw Daniel from the school as the debt had accumulated into over a million naira. “Where will the family cough out over a million naira from? They have concluded plans to withdraw the boy from the school since the governor is not responding. “The problem is that Daniel is not ready to leave the school. We have been trying to convince him but to no avail,” the source added. Efforts by this reporter to speak with the school authority could not yield any fruit. However, when DAILY POST contacted one of the aides to the governor, he denied knowledge of the development. He said it might be lies concocted by the governor’s opponents to rubbish his image. “Though, I am not in the right position to speak on this rumour, but I can assure you that this is baseless and full of lies. “I am sure some political enemies are at it again. The Peoples Comrade will never fail on his promise. Several children are being sponsored by the state government and no one has dropped out of school because of fees. “I don’t know where this rumour is coming from but I will get back to you,” the aide said..